Although you can use your iPhone’s virtual keyboard to type google.com, yahoo.com, or bing.com in the Safari address field, Apple doesn’t require that tedious effort. Instead, you tap into Google, Yahoo!, or Bing by using the dedicated search box. The default search engine on the iPhone is Google. Yahoo! or Bing must come off the bench. If you want to switch the search box from Google to Yahoo! or Bing, on the Home screen, tap Settings→Safari→Search Engine, and then tap to choose one search behemoth over the other. Tap the Safari icon at the bottom of the Home screen. The field expands and temporarily replaces the address bar at the top of the screen, and the virtual keyboard slides up from the bottom. Enter your search term or phrase and then tap the Google button in the lower-right corner of the keyboard to generate pages of search results. The button will read Search, rather than Google, if you’ve selected Yahoo! or Bing as your default search engine. New with iOS 4 are search suggestions. Start tapping out some letters and you’ll start to see results. 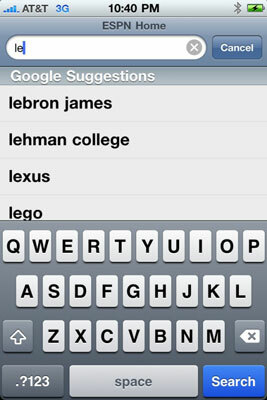 In this figure, for example, typing the letters le yields such suggestions as Lebron James and Lexus. Tap any search results that look promising or keep tapping out letters. 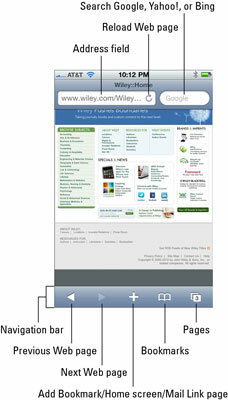 You can also search the Web through Spotlight, which appears at the top of the Home screen. Merely enter your search term in the Spotlight search field, and then tap Search Web. Using Spotlight initiates a Google search, even if you’ve chosen Yahoo! or Bing as your search engine.